A painter of southern landscapes, Joseph Meeker was born in Newark, New Jersey and grew up in Auburn, New York. 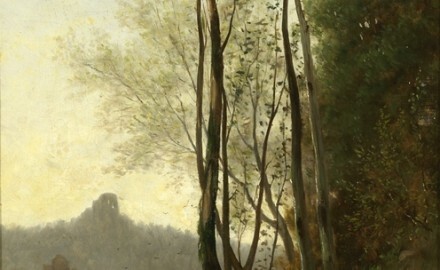 He received a scholarship to the National Academy of Design in New York City, where he studied with the Hudson River School painter Asher B. Durand and with portraitist Charles Loring Elliott. After studying in New York City, he established a studio in Buffalo, 1849-52. He then moved to Louisville, Kentucky 1852-59, before settling permanently in St. Louis, Missouri, where he painted the Louisiana Bayou. During the Civil War he fulfilled his military duties as a Union Navy paymaster on a gunboat that traveled the Mississippi River. While traveling along the Mississippi River he sketched the bayous and swamps of Louisiana. When Meeker returned to St. Louis, Missouri, he became quite successful as a painter of southern landscapes based on the drawings he did in the military. During the 1870s and 1880s, Meeker worked in the manner of Luminism. “Meeker used light and color to heighten emotional impact and captured the hazy atmosphere light in the swampy environment. 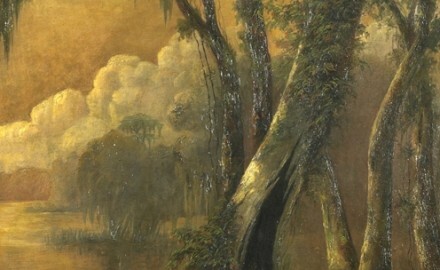 Meeker’s paintings were influenced by the nineteenth century’s waning romanticism and Henry Wadsworth Longfellow’s poem about eighteenth-century Acadian exiles, Evangeline.” Meeker is best known for his bayou swamp scenes, but he also created landscapes of the New England coast, the Wyoming territories, Minnesota, along the Merrimac River (NH), and also created portraits and did some writing.